Fall salmon season is kicking off in the Northwest. On the Rogue River in Southern Oregon we’re in the middle of our salmon run. On the middle section we have a bad population of Umpqua pikeminnow’s that steal bait before it hits the bottom. To combat the problem, and be able to fish cured roe, we have to take a page from the Great Lake’s fisheries and tie up spawn sacks. Spawn sacks solve two problems for anglers, not only on the Middle Rogue, but many other Northwest rivers. When fishing a system that has bait stealers like the pikeminnow’s (or smolts) spawn sacks withstand the constant pecking and last long enough for a salmon to find your bait. Instead of lasting a couple of minutes you can fish your bait for up to an hour. The second issue the spawn sacks help to alleviate is a small bait supply. 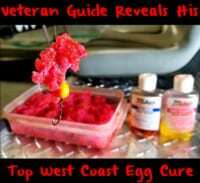 Most anglers don’t have a never ending supply of eggs, so making what eggs you do have stretch further is a huge benefit. With the spawn sacks you won’t have to bait up as often, and if you add tuna like I do, you can use less eggs for each bait. You will also find that occasionally you can use the same bait for multiple fish. My record is three salmon on one bait. Tying up spawn sacks can seem like a daunting task, but investing the time the night before will save you lots of time (and bait) on the water. Here’s what you’ll need and how I do it to be as time efficient as possible. Before starting you’ll want to cut your netting into large squares. You can buy precut material from fishing stores, but I recommend going to the craft store. 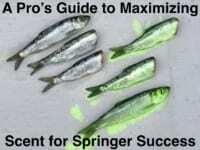 You’ll be able to make larger baits and the material is cheaper. The netting is called Tulle and comes in many different colors. I prefer chartreuse, but red, pink and orange all work. Cut your eggs into bait-sized chunks slightly smaller than what you would normally fish and place them into your Tupperware container. Also add the entire can of tuna packed in oil, and your favorite scents. I add Fire Power (powdered krill) to mine. Mix everything together thoroughly. Grab a piece of netting and place two or three Puff Balls in the center. Then place a bait-sized chunk of your egg and tuna mix on top. Close the netting by grabbing all of the edges and lightly twisting them together. While holding the sack together make about 12 wraps with the Magic Thread pulling it tight every 3-4 wraps. After 12 wraps you can break the thread by pulling it tight and it won’t come undone. Half hitches aren’t necessary. Trim the excess netting, and it’s good to go. When fishing spawn sacks I like to pierce the hook through a small chunk of the netting, and then take the bait loop around the entire sack. This will ensure that it stays on the hook while leaving the entire point exposed. You can fish them any way you would loose skeins such as back bouncing, behind a diver, or under a float. Editor’s Note: Steven Theel operates SO Chrome Guide Service. For more information on his Southern Oregon salmon and steelhead trips please visit http://so-chrome.com.